Dark and unattractive old crowns can make you feel self-conscious when you smile. 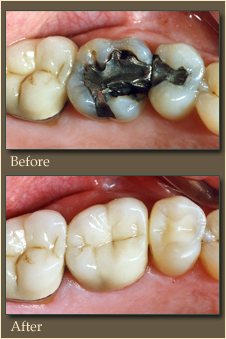 A porcelain filling replaces old, unsightly mercury fillings and eliminates the discoloration that the metallic solutions left behind. The porcelain holds the tooth structure together, strengthening the teeth. Porcelain fillings offer patients metal-free dentistry, which allows light to flow through and reflect off the teeth, leaving a more natural smile.